Lendr is a small business loan provider that lends up to $500,000 for a wide variety of expenses, ranging from equipment financing to stocking up on inventory. It takes as few as 5 minutes to apply for a cash advance that you can put your hands on in as soon as 1 → 2 business days, even if you don’t have perfect credit. As long as your credit score is above 520, Lendr may be able help you finance any business expense or working capital shortfall. However, your business will need to be up and running for at least 12 months and be generating revenues of $10,000 or more monthly to qualify. If you can jump over those hurdles, you could get access to cash fast for terms as short as 4 months. For borrowers who already enjoy top notch credit scores, shop around to compare rates from lenders who may be more competitive. Is Lendr Right For You? What Can You Get A Lendr Loan For? Lendr is an attractive alternative to small businesses who need cash fast. Within a couple of days, you can receive up to $500,000 to finance working capital needs whether adding more seats to a restaurant, improving a showroom, advertising, or any other expense. The fast timeline to funding comes at a cost of 1.25% per month or higher, which translates to a minimum of 15% annually. The term lengths can be as short as 4 months which may be perfect for businesses looking to stock up on inventory for a spike in holiday sales. Lendr promises no hidden fees and no lengthy paperwork, but it is worth checking out which charges apply before signing any loan agreements. The short loan terms offered by Lendr are attractive because longer duration terms result in higher interest charges. However, if you need cash on hand to pay for employee salaries, business development, or marketing costs, you may not have much choice but to select a longer term loan. Lendr provides Client Cash Advances (CCA) to help small businesses grow. In return, Lendr requires you to pay back the advance plus a fee. The way Lendr ensures that you follow through on your obligation is by taking a fixed percentage of your daily bank deposits until the entire amount is paid back. For a lot of business owners this repayment structure is helpful because it is aligned with your cash flow. You can also explore variable payment schedules with Lendr. 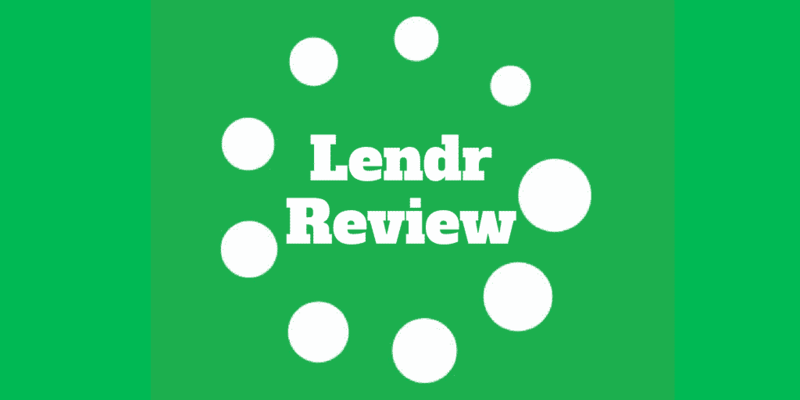 So, if you are worried about taking on a fixed repayment schedule from other lenders that don’t work with your cash flow, Lendr may be a great fit. For small business owners who enjoy top notch credit scores above 750, loan providers like Kabbage are worth checking out to see if better rates are available. Keep in mind that the 1.25% per month minimum rate can add up to a hefty interest rate charge over a long time period so, where possible, it is best to limit the loan period. Lendr is different from most traditional small business lenders who hone in on credit scores to make lending decisions. Instead, Lendr wants to know how long you have been in business and how much you receive in monthly revenues, believing those metrics provide key financial insights. It makes sense because a business may have weak financials even though the owner may have a good credit score, and vice versa. By examining revenues, Lendr can more accurately adjudicate the default risk when issuing a loan and better determine the right interest rate to charge. Lendr is a good fit for businesses who need money fast and are willing to pay higher interest rate charges for the speed and convenience. Lendr provides cash advances to small businesses who need to invest in inventory or equipment to grow, or who are experiencing sales fluctuations. Even if the issue is a delay in accounts receivable, it may be possible to receive funding. Generally, traditional lenders will limit cash advances to business applicants with top notch credit histories but Lendr will work with you so business cash flow is not sacrificed. As long as you have been in business for at least twelve months, you may qualify for a Lendr small business loan. When you are looking to get your business off the ground, startup funding is not readily accessible at many credit unions and major financial institutions. New business owners often run into brick walls even with online lenders. So, Lendr earns high marks for being willing to partner with eligible fledgling businesses for funding needs. Whether you are a small or midsize business applicant, Lendr will work with you up to the tune of $500,000. As an A+ rated company by the Better Business Bureau, Lendr has a proven track record of honoring its commitment to partner with business clients to achieve their goals, whether that means flexible small business funding options or variable repayment schedules. Each business has different working capital needs that are based on the difference between their assets and liabilities. A restaurant owner may need working capital to improve a storefront while a toy store may need working capital to finance inventory over the holidays. Whatever the issues, whether sales cycles or challenges with suppliers, Lendr provides the working capital resources to support businesses through the ups and downs of the business cycle. Lendr is best for borrowers who need money in a hurry and are willing to pay a premium for fast access to cash, whether for working capital needs, equipment financing, or other expenses. ✅ Fast Access To Cash: It takes just a few minutes to apply and anywhere from 1-2 business days to receive cash funding. ❌ High Fee Rates: Monthly rates start at 1.25%, so creditworthy borrowers with good credit histories should compare rates. ✅ Up To $500,000: Lendr provides up to $500,000 for term lengths as short as 4 months. ✅ Credit History Not Prioritize: As long as your company has been in business for 12 months or more and makes at least $10,000 per month, you may be eligible for a cash advance from Lendr. ✅ Financial Statement Analysis: Lendr makes decisions to provide cash analysis by examining more than your credit score; it focuses on your profit & loss statement line items too. ✅ Flexible Payment Terms: Lendr connects to payment terminals and takes a percentage of your bank deposits so business cash flow is not sacrificed. ✅ Short-term Loans: Loans are available for as little as 4 month terms. ✅ No Hidden Fees: Lendr commits to full transparency and a no hidden fee policy but make sure to enquire what fees are disclosed before agreeing to any loan. Lendr provides cash advances to small and midsize businesses as well as startup businesses in need of capital for virtually any expense, ranging from stocking up on inventory to equipment financing. Applicants can receive as much as $500,000 in as few as 1-2 business days for term lengths of 4 months or more. Unlike many traditional lenders who place a heavy emphasis on credit scores, Lendr pays more attention to how long you have been in business and your monthly revenues, so even if you don’t have a stellar credit history you may still be eligible for a loan. For small business applicants who have top notch credit histories, it is worth shopping around because Lendr charges a minimum 1.25% interest rate per month, which is not egregious in light of the speed and convenience of funding but equally may not be the most competitive rate available. The bottom line is if you need access to cash in a hurry and want to partner with a lender that has a top notch rating from the Better Business Bureau, and lots of positive feedback from customers, Lendr may be a good fit.